The simplest and purest way to really relax is to let time flow, wander at will and let experiences unfold before you. The beauty of taking a road trip on the Great Eastern Drive is that you can explore and discover Tasmania’s east coast at your own pace. Take a whole day to stare at the sky if you like, or sit on a beach and snooze, or pull over at lookout after lookout and take photos to your heart’s content. The pace of life here is easy and unrushed. All you have to do is relax and enjoy it. You’ll find shops, boutiques, art galleries and studios in towns all along the Great Eastern Drive. Stroll the streets to discover galleries that showcase art and crafts from local Tasmanian artists. Options include Gallery ArtSpaces Cafe and Spring Bay Studio & Gallery at Triabunna, Artifakt Gallery and Café and Bear Cottage Crafts at Swansea, Earth, Land and Sea Art Gallery and Waubs Bay Gallery at Bicheno, Gallery Pejean at White Sands Estate, Four Mile Creek, Gone Rustic Studio and Gallery in St Mary’s and Big Shed Studios and the Suncoast Gallery at St Helens. 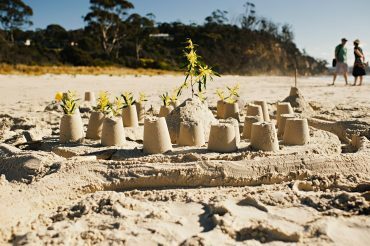 The annual Bay of Fires Winter Arts Festival is a celebration of local art and artists that takes place over the long weekend in June and includes the Bay of Fires Art Prize and Bay of Fires Arts Market. Shoppers can spend many happy hours browsing stores in east coast towns. Galleries offer art and crafts for sale and shops offer everything from antiques and collectibles to stylish clothing and quirky onsite cafes. Wander at your leisure to discover places like the Lifebuoy Café and Quail St Emporium in St Helens, the delightful Coastal Style, and the eclectic Log Cabin Store in Bicheno, and Felicity’s Vintage and Tea Room and Morris General Store in Swansea. Allow time as you journey along the Great Eastern Time, to stop and stroll in east coast towns and seaside villages. There are countless things to discover in each place – from galleries and studios to shops and cafes, beaches, walks and lookouts. Take your time, relax and wander at will.